Drexel’s LeBow College of Business received a $237,900 grant from the Ewing Marion Kauffman Foundation to support research into global trade and entrepreneurship. The three-year study, starting in October, will look at the effect of globalization and import competition on entrepreneurship in the United States. 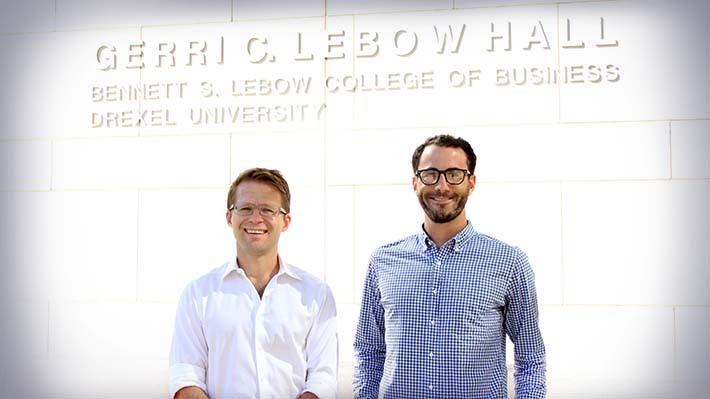 It is lead by a team from LeBow’s School of Economics, including associate professor Andre Kurmann, PhD, and assistant professor Philip Luck, PhD. Kurmann has been at Drexel for about two years and previously served as an economist at the Federal Reserve in Washington, D.C. Luck joined the LeBow faculty last year and focuses his research in the area of international trade. A doctoral student from the School of Economics will join the pair as they travel to Washington, D.C., to explore restricted data available from the U.S. Census Bureau. They plan to look specifically at the decline in economic activity over the past few decades by small businesses, which many believe are more likely to be linked to innovation than larger firms, which have seen an increase during this same time. They will explore the data to attempt to highlight a systematic link between the rise in import competition and small firm activity decline. Additionally Kurmann and Luck will look at the direct effect on industries and local economies by globalization. Based on their preliminary research, they do expect to find a clear link, which could lead to additional research on the extent of the impact and policy. “It’s basically a data question. The puzzle in the literature comes from the data,” Kurmann says. Through the grant, LeBow will contribute to the Kauffman Foundation’s effort to create a larger pool of knowledge about entrepreneurship and economic growth. The foundation offers numerous grants that provide support to programs and research that advance the organization’s mission “to help individuals attain economic independence by advancing educational achievement and entrepreneurial success.” Drexel’s Office of Institutional Advancement’s Foundation and Corporate Relations alerted the team to the grant and supported their application process. The grant itself will be used to secure access to data and support travel. As part of the project, Drexel will host an on-campus research conference on the effect of globalization on entrepreneurship during its third year, in addition to submitting results for publication. Andre Kurmann, PhD, and Ishan Ghosh have landed a grant to advance research concerning the dynamics of entrepreneurship. School of Economics PhD student Ishan Ghosh will attend the 9th annual National Bureau of Economic Research’s Entrepreneurship Research Boot Camp in Cambridge, Mass., this summer. For many, a country’s reputation ranking doesn’t mean much, but when three LeBow professors examined its impact on trade, it told a different and surprising story. Innovative graduate and undergraduate programs taught by outstanding faculty who conduct cutting-edge research on topics relevant to industry and government policy. Receive a master’s in economics for integrated training in core economics, quantitative methods and policy analysis with flexibility to best match your career aspirations. Students concentrate on one of three fields of study: Industrial Organization, International Trade and Macroeconomics and receive strong training in Applied Microeconometrics.